Austin Hudgins is a Rutgers East Asian Languages and Cultures M.A. student. His paper, “Daoist Trajectories and Confucian Concentrations:18th Century Manchu Assimilation Assessed Through the Aim of Archery,” was selected and highly recognized by the committee for the 67th Midwest Conference on Asian Affairs held in October 2018 in St. Paul, MN. Austin’s paper dealt with an 18th-century Manchu treatise regarding archery that he has been translating from the Manchu language under the direction of Dr. Simon Wickhamsmith in the ALC department. Those who attended his presentation were fascinated by the novel combination of archery and Manchu language. Austin also had a paper accepted for presentation at the Colorado University Boulder Asian Studies Graduate Student Conference (CUBASGA) in February 2019. The paper focused on the topic of developing 'virtue' through archery - as the Manchus viewed it. Abstract: Amidst imperial anxiety concerning Manchu acculturation into Han Chinese society, the Qianlong emperor (r. 1735-1796) of China’s Qing dynasty (1644-1912) promoted the performance of archery as a fundamental component in evaluating a Manchu bannerman’s adherence to the fe manju i an, or the “old Manchu usages”. Fearing the loss of Manchu collective identity after more than a century of conquest rule, the Qianlong Emperor sought a social revivification of archery amongst Manchu bannermen to preserve notions of tradition, ethnicity, and martial praxis. Nonetheless, although contemporary Qing historians have debated the degree to which Manchus adopted aspects of Chinese culture from the perspectives of economic and social institutions, few have examined the same topic from the perspective of archery despite its principal position in the Manchu’s conceptualization of self. However, this article, through textual analysis of the 1770 Manchu archery treatise, titled [The Aim of Archery], written by Manchu bannerman, Vice-General, and Provincial Governor Yehe Nara Changjun (?-1789), discusses the extent to which Manchu tradition, specifically the tradition of archery, remained traditionally Manchu by the mid-18th century. In sourcing the myriad citations from Neo-Confucian and Daoist texts found within the Manchu treatise’s structured schema of archery, this article suggests a Manchu appropriation with Han psychosomatic philosophy to conceptualize pre-performative and concentrative aspects of archery including the “rectifying of mind”, and “cultivation of qi (氣) energy”. Subsequently, although 18th century imperial Manchu cultural conservatives portrayed archery as a cornerstone to Manchu identity, this article’s findings not only interrogate the purity of a unique Manchu archery tradition, but also address the degree to which Manchu self-depictions of cultural heritage was negotiated through an understanding of Han ideologies. On September 17, 2018, The State of New Jersey approved three new majors in Asian Studies (formerly known as East Asian Languages and Area Studies), Japanese, and Korean. The new major programs will be implemented during the academic year 2018-2019, and students can then choose to major or minor in Asian Studies, Chinese, Japanese, or Korean. Majors earn their B.A. in Asian Studies, B.A. in Chinese, B.A. in Japanese, or B.A. in Korean. The University of Fukui (UF) has reestablished an academic agreement with Rutgers, The State University of New Jersey (U.S.A.). 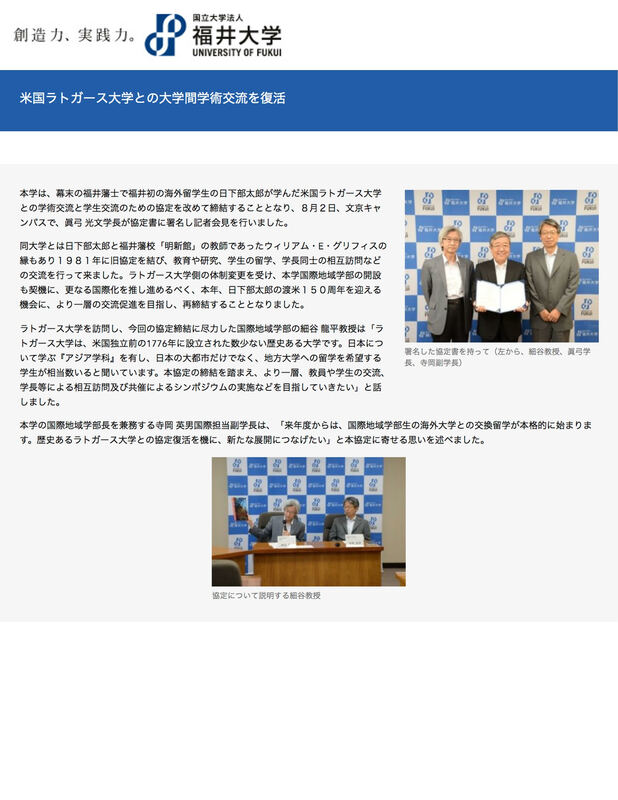 Dr. Mitsufumi Mayumi, President of UF, signed the agreement on August 2 at the Bunkyo campus. This was followed by a press conference. Rutgers is known as the University where Taro Kusakabe, a retainer of Fukui Domain, was sent to study as one of Fukiui’s first overseas students at the end of the Edo period. William Griffis, who taught Kusakabe at Rutgers, was subsequently invited to Fukui as one of the first American teachers to support Japan’s enlightenment in the early years of Meiji. He then became a leading Japanologist/Orientalist of that era. Following the footpath of Kusakabe and Griffis, there was a revival of the relationship in the 1970s which culminated in a mutual visit by the Presidents of the two Universities, leading to the signing of an old agreement for scholarly exchange in 1981. This was followed by active exchange of faculty and students up till the 1990s. In response to recent developments, in particular the opening of the School of Global and Community Studies (GCS) at UF, the two Universities have agreed to renew the agreement with a view to reactivating and expanding the exchange. This comes at an auspicious year marking the 150th anniversary of Taro Kusakabe’s arrival at Rutgers. According to Professor Ryuhei Hosoya, who acts as focal point for Rutgers at GCS, Rutgers University, now one of the United States’ leading institutions for research and higher education, traces its origin to one of the few colonial colleges chartered before the American Revolution. He is in direct contact with the Department of Asian Languages and Cultures at Rutgers, where a large number of students are majoring in Japanese studies. Certain among them as well as RU faculty members would hopefully look to Fukui as a region of Japan to be rediscovered and explored and UF/GCS as a worthy place for learning and research. Nathan Gwira, a first-generation American, has been named a 2016 Charles B. Rangel International Affairs Fellow – the second Rutgers graduate to be honored. The prestigious fellowship will provide Gwira about $95,000 toward tuition, fees and living expenses while he pursues a master's degree in international affairs over the next two years. After earning a degree, the fellowship program requires at least a five-year commitment as a U.S. Foreign Service officer. When he studied abroad in China – with professor of Chinese and Asian Languages & Cultures department chair Richard VanNess Simmons leading the program – Gwira was so interested in Chinese language and culture that he moved there for two years after graduation and taught English while learning and becoming fluent in Mandarin Chinese. He's also fluent in the West African languages of Akan/Twi and Fante, and he's familiar with French. The Rangel Graduate Fellowship program – a joint effort between Howard University in Washington and the state department – selects 30 Rangel Fellows each year. Its goal is to prepare those chosen for U.S. Foreign Service careers, where they can help form, represent and carry out U.S. foreign policy. Alongside famed social and political activists and Nobel Prize laureates, Professor Kim ventured across the most heavily militarized border in the world. 30 women hailing from North and South Korea, Ireland, Liberia, Colombia and the United States, among other countries, crossed Korean Demilitarized Zone (DMZ) for a peace walk held on May 24, 2015, a day designated as International Women's Day for Peace and Disarmament. His facility with foreign tongues "just popped up along the genetic lines"
As the U.S. “pivots” towards the Asia-Pacific through new trade and security negotiations (i.e. Trans-Pacific Partnership), this international symposium comes at a timely moment to engage in a critical dialogue about militarisms in the 21st century, from historical legacies across Asia and the Americas to their impact and implications for global health, local communities, and artistic/cultural expressions. 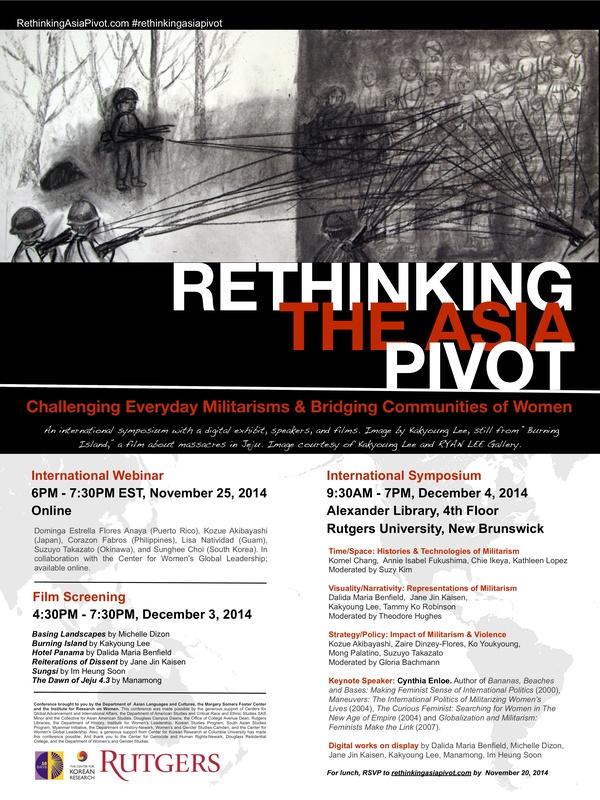 How will the “pivot” impact Asia and the Americas? How do scholars, activists, and artists respond to the changing climate of security and increased securitization? What’s at stake in particular for women, who have historically shouldered the costs of increased militarization? What are the health implications of militarisms from environmental impacts to physiological and psychological impacts of living near or on military bases? How are such health impacts gendered? What are the environmental consequences of natural disasters and the subsequent impact of disaster militarism on local communities? What are the generational impacts of military policies – for young people recruited, veterans, their families, local communities and nations? These are some of the questions to be addressed in the multi-panel symposium, complemented by a concurrent video art exhibition and a pre-symposium international webinar panel discussion. Panel Chair: Mori Yuria, Waseda University, Tokyo. The Department of Asian Languages and Cultures initiates Rutgers participation in CIC (Committee on Institutional Cooperation) course share program. We are pleased to announce that this past weekend three Rutgers students in our Chinese language program participated in Chinese speech contests that were held at nearby venues in the tri-state area and two of them placed among the winners! Anh Tran and Kayla Krause competed in the 2014 Dragon Cup Competition 中华龙杯 that was held at Joseph's University on Saturday, March 29, and Anh won second place in the beginner's level. Congratulations to Anh! Kayla and Anh are both first-year students who have been studying Chinese for just 5 months. Both are greatly enjoying learning the language. Kayla's presentation was a "Story of Mine" and Anh told a "Vietnamese Children's Story." Both of them did a terrific job. Jeremy Yeaton competed in the Senior Level of the Fifth Chinese Bridge 汉语桥 Eastern USA Chinese Proficiency Competition for Foreign College Students at Pace University on Sunday, March 30, 2014, and won Third Prize. Jeremy, a junior double majoring in French and linguistics and minoring in Chinese, delivered a humorous marketing pitch and gave a tone-perfect rendition of the Chinese pop song "Lǎoshǔ ài dàmǐ (the mouse loves rice)." Congratulations, Jeremy! Asian Languages and Cultures Professor Paul Schalow has been honored with the SAS Award for Distinguished Contributions to Undergraduate Education in Spring 2013. Read his story on the SAS announcement page <http://sas.rutgers.edu/news-a-events/feature-archive/1525-2013-recipients-of-sas-teaching-awards-announced>, where you can learn more about his contributions to our department's curriculum and his accomplishments within and beyond the classroom. Also, enjoy the photos from the awards ceremony, which included remarks from Rutgers President Robert L. Barchi and SAS Acting Executive Dean Richard S. Falk. With support from the office of the Executive Vice President for Academic Affairs, the Dean of the School of Arts and Sciences has initiated a semi-coordinated set of 5 faculty hires in Chinese studies over the next two years. Faculty searches are now underway in Political Science and Economics for candidates researching on Chinese politics and economy, respectively. The Department of Asian Languages and Cultures is currently conducting a faculty search in Classical Chinese studies, for which research fields may include Classical Chinese literature, philosophy, and cultural studies. Faculty searches in History and Religion will take place in 2012-2013. Reinforce and Improve your Chinese, Speak it as you Earn Course Credit, and have fun traveling in far away, exciting China!!! Be ready to sign up soon! China Course excursions will include Beijing, the Great Wall & more —maybe even Xi’an! Rutgers University has been admitted to the Committee on Institutional Cooperation (CIC) beginning July 1, 2013. The CIC is the prestigious academic consortium whose membership includes all Big Ten institutions and the University of Chicago. The invitation to join CIC is a concomitant advantage of membership in the Big Ten athletic conference, which Rutgers will join in 2014. "The CIC, which is governed by the chief academic officers/provosts of the member universities, is committed to advance its members’ academic missions, leverage campus resources such as libraries and equipment, share expertise, and expand academic and research opportunities for students and faculty. With the addition of Rutgers and the University of Maryland (which has also been admitted), the CIC universities collectively engage in $9.3 billion in funded research and own more than 100 million library volumes. Our students will gain new academic opportunities because of Rutgers’ membership in the consortium. To give one example, CIC’s CourseShare program gives students access through distance technology to more than 120 less commonly taught languages. There are also summer research opportunities, shared study abroad programs, and reciprocal library borrowing, among other benefits." A CIC membership will greatly expand Rutgers faculty and students’ access to library materials in East Asian studies. Through the reciprocal borrowing program of CIC, members of Rutgers community will be able to borrow library books directly from other CIC institutions, most notably University of Chicago and University of Michigan, both with top-tier East Asian collections in North America. A similar program (EZ Borrow) has already existed between Rutgers and research universities in Pennsylvania, which includes University of Pennsylvania and University of Pittsburgh, both with fine East Asian collections. For more information on the CIC, visit www.cic.net. To view a four-minute video overview of the consortium, visit www.cic.net/Home/NewsAndPubs/Multimedia/Videos/CICVideo.aspx. Click on "shouquan shiyong" (authorized access) to enter. Times out after thirty minutes of idling. Description: Scripta Sinica (Hanji dianzi wenxian) is one of the largest Chinese full-text database, with a special focus on the traditional Chinese classics. As of February 2012, it contains almost all of the important Chinese classics, totaling more than 580 titles and over 423 million Chinese characters. Users can conduct full text searches or browse by book titles in it. The database is provided by the Institute of History and Philology (IHP), Academia Sinica (Taiwan), which will continue to add new titles and new features. Rutgers users can also access the non-IHP resources provided by Academia Sinica on the old interface. Help: User instruction ("shiyong shuoming") is available inside the database. Dates covered: Antiquity to 1949. Print counterpart or related resources: None. We are pleased to announce that the online Bibliography of Asian Studies (BAS) is now available for on and off campus access. The Bibliography of Asian Studies (BAS) is the major multi-disciplinary index for the study of East, Southeast, and South Asia. It contains citations to Western language works published worldwide on all subjects pertaining to this vast region, especially in the humanities and the social sciences. Currently, the number of citations is approaching 800 thousand. The online BAS offers users various methods to search, browse (by country-subject or journal title), download, and email citations. The "Find it @ your library" button under each record can be used to retrieve the full-text article, identify the availability of the print copy, or make an ILL request. In Spring 2011, President McCormick announced the launch of a major initiative to develop China related programs across Rutgers University. A first step in this initiative is the search for a Director, which is currently underway. In the early stages of this initiative, in order to provide an overview of the various efforts across the Rutgers campuses, Dean Marc Holzer of the School of Public Affairs and Administration has set up a "Rutgers in China" web page to which different units of the university may post descriptions of their activities in China. Rutgers Multimedia Chinese Teaching System was given an international award.